I’ve seen root beer bottles with many different types of animals on them, but this is the first rabbit. My daughter saw it and said it is an Easter Bunny root beer. Actually, it’s made by Rabbit Ridge Winery’s spin off soda line, Paso Pure, so the rabbit is from that. The sodas were developed in 2015 for all the children and designated drivers that come out wine tasting, which means that people must drink way too much out there if they need designated drivers. The line is called Paso Pure because they use pure ingredients and they’re located in Paso Robles. It’s run by the daughter of the winery owners. The label is a bit perplexing since “Rabbit Ridge” is far more prominent than “Paso Pure.” I suspect that’s the parents reminding their daughter who’s really in charge. They also make sure to say “Soda Pop” to both frustrate and placate both sides of the soda vs. pop nomenclature war. This has a rich, creamy Body that’s full of classic sassafras flavor. Bits of vanilla and wintergreen are present as well. The abundance of spices give a pronounced Bite that isn’t overbearing and finishes silky smooth. The Head is just perfect, tall and frothy and I couldn’t ask for more. The Aftertaste is creamy vanilla with ending notes of wintergreen and clove. What a masterful brew! Seriously, this stuff is amazing! It’s one of the best brews that I’ve reviewed in awhile. 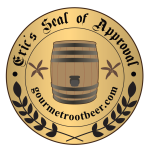 I’m proud to award this my Seal of Approval. With stuff like this on their tasting tour, I wouldn’t be surprised if everyone was volunteering to be designated driver. See how it rates against other root beers. Frost Creek Beverage is from Texas has been around for over 15 years. They recently have turned their flavor expertise to craft sodas and make a line of seven flavors including their root beer. They use only triple filtered water and pure cane sugar, no HFCS. I was thrown off at first, since the label seems to be the same dimensions and materials as some of the private label stuff. Contacting the company revealed that the sodas are all their own formulae, but they are mixed and bottled by two different bottlers, depending on the region. That makes sense, a lot of guys do it that way. They’ve got a nice and simple, yet classic looking label, which I really like. The Body is sweet and rich with creamy vanilla wrapped around a spicy sassafras core. There’s even a hint of wintergreen. The Bite is spicy, but not too much so. It finishes smooth too, so it’s about a perfect Bite. The Head is short, unfortunately, and doesn’t last long. But it isn’t too short and doesn’t fizz away too quickly. The Aftertaste is sweet vanilla; lovely, lovely vanilla. This is a wonderful brew. I love that spicy and that smooth, sweet vanilla. I wish it were a bit foamier, but it’s still more than enough in all departments. I’m proud to give this one my Seal of Approval. See how it rates against other root beers. Tractor Soda Company is a fairly new company out of Coeur d’Alene, Idaho. Like a lot of new entrants to the soda market, they are focusing on only organic and non-GMO ingredients with no HFCS. Somehow they even manage to use organic sassafras in this brew, which I thought was against some FDA rules. They demand everything is responsibly sourced as well to have minimal environmental impact. So much do they want to reduce their impact, that they’ve discontinued bottling in favor of only shipping syrups to various soda fountains. This is, actually, more environmentally friendly, but not as much fun for a root beer gourmet like myself who doesn’t do soda fountains. Luckily, after they had discontinued bottling, I found a couple at the Seattle Rocket Fizz store, and was able to grab four. Very lucky indeed. The Body is rich and complex, with sassafras, birch, wintergreen, and other herbs mixing together for an elaborate take on the archetypal root beer flavor. Then aged vanilla surfaces to steal the show. It isn’t overly sweet though, and there’s a dark molasses flavor as well that’s a bit out of place. The Bite is near perfect with the right amount of cinnamon and nutmeg and carbonation mixing together for a tasty burn. The Head is nice and tall and foamy. The Aftertaste is aged bourbon vanilla. I love that flavor. Delicious! … and complex, and wonderful. This is a solid brew by any measure. I wish it were a little bit sweeter, and not so much molasses, but those are minor complaints on arguably the best organic brew I’ve had so far. What a shame they don’t bottle it anymore. Maybe someone near by will get it on draft. See how it rates against other root beers.